tecsis: Storage and retrieval units provide quick goods turnover in high-bay warehouses. In order to guarantee safety, the FEM standards (www.fem-eur.com) and the relevant DIN-EN standards must be taken into consideration. Among other things, overload situations such as those which can occur when the hoisting carriage is blocked, for example, must be avoided. tecsis provides a cost-effective facility for detecting overload situations and switching off devices quickly and reliably with the EGS 80 digital limit switch. Force transducers can be optionally connected at the limit switch using 2 or 3 conductor technology via a current input (0/4...20 mA). The input has cable break and cable short circuit monitoring. 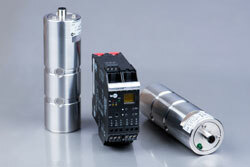 The storage and retrieval unit can be reliably switched off with the two relay outputs and the analogue current output. Integration in a higher-order control architecture is also possible without problems. The EGS80 is parametrised either using the control panel with integrated LCD display or using PC software that is provided by tecsis free of charge. If several identical storage and retrieval units are being used in a warehouse, a one-off setting can be conveniently transferred to all EGS80 devices with the software. tecsis also supplies force transducers for detecting the load at the hoisting carriage to go with the EGS80. Overload situations at storage and retrieval units can be reliably avoided with the EGS80.. The company's history shows that it has always opened up new fields of meas¬uring and sensor technology and implemented innovative solutions. An inquisit¬ive mind is very much the tradition at tecsis. A large number of the employees work on development and engineering tasks to expand the range of products using new technologies, processes and materials. This innovative strength is evident in the large share of turnover tecsis achieves with products that are on the market for a maximum of two years. With this strategy, the company positions itself clearly as a supplier of systems and solutions. The strength of the company lies in the development of cost effective solutions resulting from requirements coming from customers applications. The specialist for measuring technology has approximately 350 employees.